A fresh and crunch napa salad that is topped with golden and buttery toppings and a simple homemade dressing. Grandma knows her stuff! I can still remember the first time I had this salad. We went over to my grandma's house for a holiday dinner. She was just pulling the toasted ramen out of the oven and it smelled wonderful. I always loved holidays and grandma and grandpa's, and I still do. So I am sure that adds to the warm and fuzzy feelings I get every time I make this salad. My mom submitted the recipe in the now famous country parish cookbook all those years ago, so it is easy for me to pull out and make. Usually I make it as a side dish at gatherings, but this time I decided to add some chicken and make it an entree. It was really good that way as well! I love how simple this recipe is to throw together. You can toast the goodies ahead of time if you are making it for a gathering. 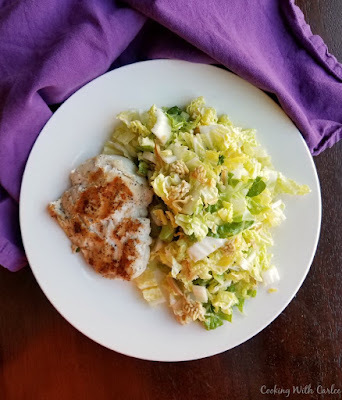 The napa chops up easily enough and the dressing just requires stirring together a few simple ingredients. Of course that can be done even a day or two ahead. My husband and I eat this with chicken as a meal at least a few times every summer. But I think it is also a really versatile side salad. I've brought it to potlucks to rave reviews. I've served it along grilled meats, with a ham and even with a roast chicken. If you aren't familiar with napa, it is a really mild kind of cabbage. You will likely find it near the bok choy in the grocery store. The leaves are tender and the ribs are edible too, so I just leave it all together and chop it up. I do try to chop the larger parts of the rib a little finer, but we eat the whole thing. Have you ever tried napa cabbage in other recipes? What are your favorite ways to use it? Preheat oven to 350 F. Place butter on a rimmed baking sheet and place in oven until melted. Break up ramen noodles into small pieces. Toss them, the sunflower seeds and almonds in butter on pan and place back in oven until toasted. Mine took about 10 minutes and I stirred them after every couple minutes. Set aside to cool. Cut Napa cabbage in thin slices. Toss with green onions. Mix together dressing ingredients and drizzle to your taste over the cabbage, tossing to coat. Sprinkle with roasted ramen and nuts. Serve immediately. Follow Cooking With Carlee's board Family Favorites on Pinterest. Now I wish I had this salad waiting for me for lunch today!! Yum!! I love a cabbage salad!! Such a flavorful mix! This sounds like a salad that me and my family would love. I love making different kinds of salads to go with dinner. Thanks for sharing this recipe. Wishing you a wonderful week and a Happy Valentines Day. Thank you, Julie! We don't eat as much salad as we probably should, but I almost always order salads when we go out to eat. I really should make more at home as I really do love them. Thanks for stopping by and have a great Valentine's Day! Jeez,this looks tasty and makes me want to actually put down the pizza and eat a salad. Pinned! That is really saying something! We really love it, I hope you do too! This Napa salad looks fresh and tasty. I like the fresh combination of simple yet tasty ingredients. It sounds great with the Napa cabbage, almonds, sunflower seeds. Thanks so much for sharing, Carlee. It is one of my favorite salads and it is so simple to make. Thank you! I love this salad, it is always delicious! Hope you have a very special Valentine Day and thanks so much for sharing with Full Plate Thursday. Isn't is so good? I hope you have a great Valentine's Day as well! This salad and spinach salad are my favorite make at home salads! This sounds wonderful. What a great weeknight dinner idea. And healthy too! Pinning! Thanks! It is one of my go-to's if I feel the need for a salad at home! Yum! Thanks for sharing at Funtastic Friday! One of my most favorite salads! I love a ramen noodle salad. Or anything Asian influenced. And I've never tried to use Napa in a salad as the base. Definitely going to try this one. Thanks for the recipe. Love hearing the family favorite recipes. I'm sure it would be fine with cole slaw or something, but I love it with the Napa. You should definitely give it a try! I know, it's terrible isn't it? Thank you! Yummy! This salad sounds so good. I have been hooked on salad lately and this is very different from what I've been eating. Can't wait to try it! Thanks for sharing at Inspiration Thursday! This is one of my favorite make at home salads. I love salads out, but don't love them nearly as much at home for whatever reason. This is one of the few exceptions! What a great salad!! I love the oriental touches!! I'm trying to eat better...this is on my list!! Thanks for sharing on My 2 Favorite Things on Thursday! Hope to see you again tomorrow! Pinned! I love napa! It is a really mild cabbage, so great for quick salads like this. I hope you give it a try soon! Isn't it fun when you don't have to go out to the store! I haven't tried it that way, but I don't see why it wouldn't work. You'll have to let me know how it goes, otherwise I'll try it myself next time I get a hankering for some napa salad! This looks delicious Carlee! I am definitely going to have to pin this and try it sometime! I love a good Asian salad especially if it has a sweet dressing or vinaigrette on it! Thank you for linking up with us at the Tips and Tricks Link Party! Cannot wait until I see what you have for us next week! Thanks! I love sweet Asian style salads too, so this was an instant hit with me. I hope you love it! This sounds so delicious! I've pinned it! YUM! Thank you, it is always a favorite! 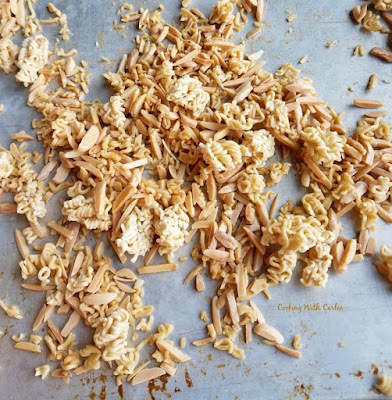 Love the combo of toasted ramen, sunflower seeds and almonds, sounds delicious! Thanks for sharing at What'd You Do This Weekend?! It is the perfect crunchy topping! Thanks for hosting! I haven't tried napa cabbage! Definitely need to pick some up! You definitely should! Even my cabbage adverse husband likes this salad! 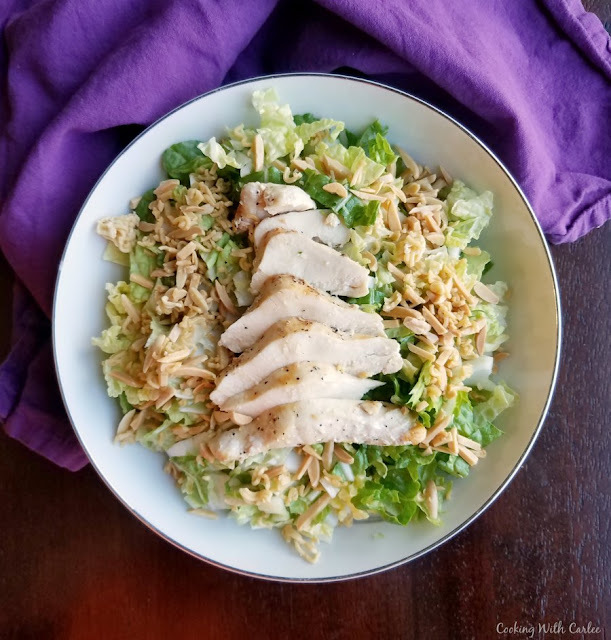 I love adding chicken to what are usually side salads. Good call on this one. It looks delicious and I love sunflower seeds in salads too. It really is a perfect summer supper! Love the sound of the dressing and all the crunch going on there. It is so simple and so good! I love napa cabbage and use it often. That dressing and those toppings sound simply wonderful. Now I'm curious how you use it! 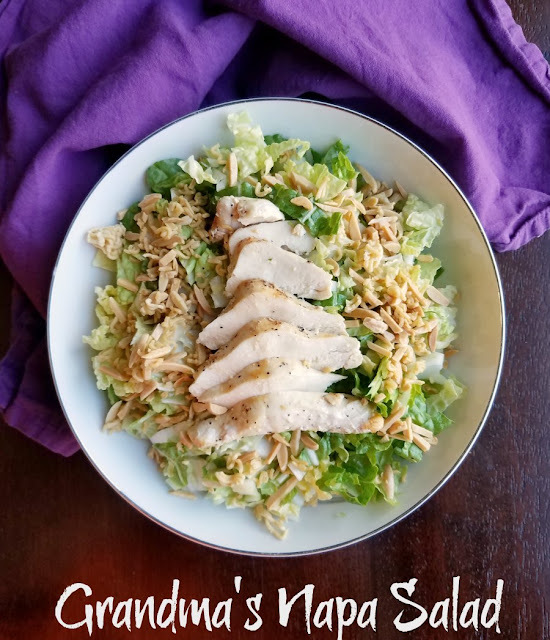 It makes the perfect crunchy salad topping! What a great use for Napa cabbage...love it!!! It is soooo good! Thanks! It is hard for me to turn down any salad this time of year. I love Summer and salads. 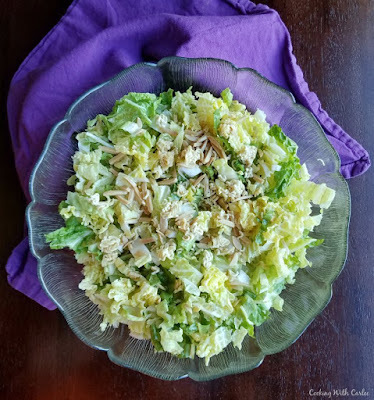 I do like cabbage and it is fun to have a cabbage salad every now and then, rather than lettuce all of the time. Thank you for sharing this recipe. I am just sure you'll love this one then! I am craving this salad. I bet it's so crunchy and delish! I made it a feature at this week's Whimsical Wednesdays Link Party. Thanks so much for sharing it with us! It's so good! Thank you so much!